An experienced professional with an event coordinator resume that is looking to facilitate jobs within a hospitality or event planning company. With a large network of contacts and positive client reputation, the job seeker has established their ability to independently contract, plan and execute successful events in many spaces. 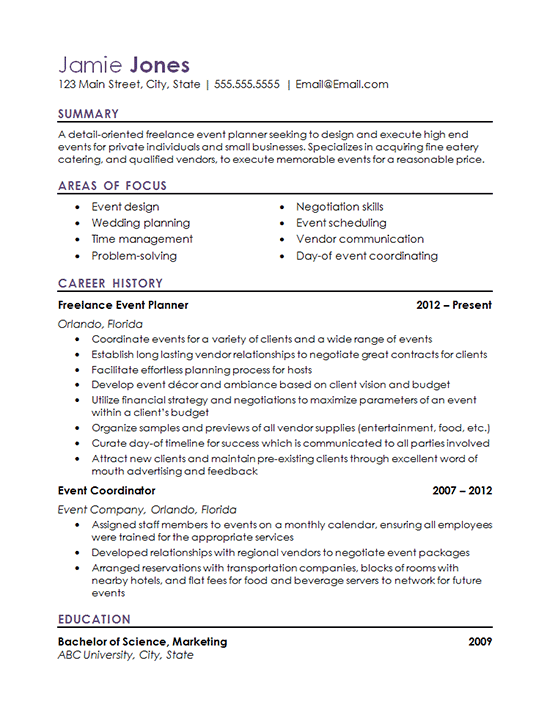 The resume highlights their ability to negotiate, budget, and manage the business side of event planning. These are the key qualities a non-professional would be looking for in someone to run their event. Coordinate events for a variety of clients and a wide range of events. Establish long lasting vendor relationships to negotiate great contracts for clients. Facilitate effortless planning process for hosts. Develop event décor and ambiance based on client vision and budget. Utilize financial strategy and negotiations to maximize parameters of an event within a client’s budget. Organize samples and previews of all vendor supplies (entertainment, food, etc.). Curate day-of timeline for success which is communicated to all parties involved. Attract new clients and maintain pre-existing clients through excellent word of mouth advertising and feedback. Assigned staff members to events on a monthly calendar, ensuring all employees were trained for the appropriate services. Developed relationships with regional vendors to negotiate event packages. Arranged reservations with transportation companies, blocks of rooms with nearby hotels, and flat fees for food and beverage servers to network for future events.